Full length native protein (purified) corresponding to Human Collagen I aa 1-1464. Collagen Type I from human and bovine placenta. IHC-P: Mouse kidney tissue. Sheep duodenum tissue. Pig lung tissue. Marmoset kidney tissue. Human colon and placenta tissue. Cow small intestine tissue. 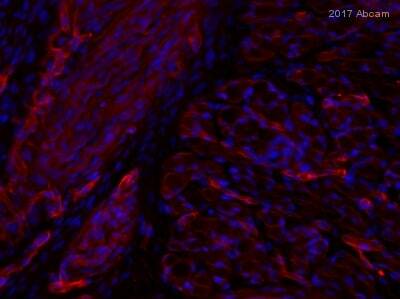 IHC-Fr: Mouse kidney tissue. Cow tendon tissue. ICC/IF: Horse bronchial fibroblast cells. ; Human keloid and normal fibroblasts. WB: Human Collagen Type 1. Wistar rat hepatic stellate cells in GFP-transduced cell lysate. ab34710 is stable at 4° C as an undiluted liquid. Dilute only prior to immediate use. For extended storage, mix with an equal volume of glycerol, aliquot contents and freeze at -20° C or below. It is often extremely difficult to generate antibodies with specificities to collagens due to the uninterrupted "Glycine-X-Y" triplet repeat that is a necessary part of the triple helical structure. The development of type specific antibodies is dependent on NON-DENATURED three-dimensional epitopes - this may result in diminished reactivity of some antibodies with denatured collagen or formalin-fixed, paraffin embedded tissues. Anti-Collagen antibodies have been used for indirect trapping ELISA for quantitation of antigen in serum using a standard curve, for immunoprecipitation and for native (non-denaturing, non-dissociating) PAGE and western blotting for highly sensitive qualitative analysis. Shipped at 4°C. Store at +4°C short term (1-2 weeks). Upon delivery aliquot. Store at -20°C long term. Avoid freeze / thaw cycle. Please see notes section. This antibody has been prepared by immunoaffinity chromatography using immobilized antigens followed by extensive cross-adsorption against other collagens, human serum proteins and non-collagen extracellular matrix proteins to remove any unwanted specificities. Sterile filtered. Our Abpromise guarantee covers the use of ab34710 in the following tested applications. Indirect ELISA 1/5000 - 1/50000. This product is not recommended for use under denaturing conditions in WB, IP, and ELISA. We would suggest testing it under native conditions. Denaturing and reducing conditions will greatly diminish reactivity and selectivity of this antibody. Abcam does not test ab34710 with endogenous samples in WB. We do recommend to look at the guidelines for blotting large proteins here. Customers have been successful using ab34710 in this application, please see references below (Tillgren V et al. J Biol Chem 290:918-25; 2015). Defects in COL1A1 are the cause of Caffey disease (CAFFD) [MIM:114000]; also known as infantile cortical hyperostosis. Caffey disease is characterized by an infantile episode of massive subperiosteal new bone formation that typically involves the diaphyses of the long bones, mandible, and clavicles. The involved bones may also appear inflamed, with painful swelling and systemic fever often accompanying the illness. The bone changes usually begin before 5 months of age and resolve before 2 years of age. Defects in COL1A1 are a cause of Ehlers-Danlos syndrome type 1 (EDS1) [MIM:130000]; also known as Ehlers-Danlos syndrome gravis. EDS is a connective tissue disorder characterized by hyperextensible skin, atrophic cutaneous scars due to tissue fragility and joint hyperlaxity. EDS1 is the severe form of classic Ehlers-Danlos syndrome. Defects in COL1A1 are the cause of Ehlers-Danlos syndrome type 7A (EDS7A) [MIM:130060]; also known as autosomal dominant Ehlers-Danlos syndrome type VII. EDS is a connective tissue disorder characterized by hyperextensible skin, atrophic cutaneous scars due to tissue fragility and joint hyperlaxity. EDS7A is marked by bilateral congenital hip dislocation, hyperlaxity of the joints, and recurrent partial dislocations. Defects in COL1A1 are a cause of osteogenesis imperfecta type 1 (OI1) [MIM:166200]. A dominantly inherited connective tissue disorder characterized by bone fragility and blue sclerae. Osteogenesis imperfecta type 1 is non-deforming with normal height or mild short stature, and no dentinogenesis imperfecta. Defects in COL1A1 are a cause of osteogenesis imperfecta type 2A (OI2A) [MIM:166210]; also known as osteogenesis imperfecta congenita. A connective tissue disorder characterized by bone fragility, with many perinatal fractures, severe bowing of long bones, undermineralization, and death in the perinatal period due to respiratory insufficiency. Defects in COL1A1 are a cause of osteogenesis imperfecta type 3 (OI3) [MIM:259420]. A connective tissue disorder characterized by progressively deforming bones, very short stature, a triangular face, severe scoliosis, grayish sclera, and dentinogenesis imperfecta. Defects in COL1A1 are a cause of osteogenesis imperfecta type 4 (OI4) [MIM:166220]; also known as osteogenesis imperfecta with normal sclerae. A connective tissue disorder characterized by moderately short stature, mild to moderate scoliosis, grayish or white sclera and dentinogenesis imperfecta. Genetic variations in COL1A1 are a cause of susceptibility to osteoporosis (OSTEOP) [MIM:166710]; also known as involutional or senile osteoporosis or postmenopausal osteoporosis. Osteoporosis is characterized by reduced bone mass, disruption of bone microarchitecture without alteration in the composition of bone. Osteoporotic bones are more at risk of fracture. Note=A chromosomal aberration involving COL1A1 is found in dermatofibrosarcoma protuberans. Translocation t(17;22)(q22;q13) with PDGF. O-linked glycan consists of a Glc-Gal disaccharide bound to the oxygen atom of a post-translationally added hydroxyl group. Other Band(s): Collagen Type I splice variants and isoforms. Immunocytochemistry/ Immunofluorescence - Anti-Collagen I antibody (ab34710)Kang SU et al. Opposite effects of non-thermal plasma on cell migration and collagen production in keloid and normal fibroblasts. PLoS One 12:e0187978 (2017). The expression of Collagen I was examined in Normal fibroblasts and keloid fibroblasts using ab34710 at 1/50 dilution in ICC/IF analysis. Cells were cultured on microscope coverslips (Thermo Fisher Scientific, Rochester, NY, USA) and treated with NTP (Non-thermal plasma). After 24 h, the slides were washed with PBS, fixed for 20 min in 3.7% formaldehyde and rehydrated in PBS. After blocking for 45 min in bovine serum albumin dissolved in 5% PBS, the slides were incubated for 1 h with sb34710 at 1/50 dilution then washed with PBS and incubated for 45 min with an Alexa 488-labeled goat anti-rabbit antibody at 1/250 dilution. NTP reduced the expression of Type I collagen in KFs as revealed by the immunocytochemistry and Sirus Red stain. Immunofluorescent and Sirus Red staining for Type I collagen were observed in NFs and KFs after treatments with gas or NTP. Row 1 and 2: Analysis of Collagen I in Normal fibroblasts by Sirus Red and IF respectively. Row 3 and 4: Analysis of Collagen I in Keloid fibroblasts by Sirus Red and IF respectively. Column 1 is the control. Column 2 is the control gas treatment (Argon and nitrogen at 200:500). Column 3-5 were exposed to NTP for 10, 30 and 60 seconds respectively. ab34710 staining Collagen I in mouse kidney tissue sections by Immunohistochemistry (IHC-P - paraformaldehyde-fixed, paraffin-embedded sections). Tissue was fixed with formaldehyde and blocked with 2.5% horse serum for 1 hour at 25°C; antigen retrieval was by heat mediation in a citrate buffer. Samples were incubated with primary antibody (1/500 in PBS 1X + 3% of 2.5% horse serum) for 12 hours at 4°C. An undiluted HRP-conjugated Horse anti-rabbit polyclonal was used as the secondary antibody. Immunohistochemistry (Formalin/PFA-fixed paraffin-embedded sections) - Anti-Collagen I antibody (ab34710)This image is courtesy of an anonymous abreview. ab34710 staining Collagen I in pig lung tissue sections by Immunohistochemistry (IHC-P - paraformaldehyde-fixed, paraffin-embedded sections). Tissue was fixed with 10% buffered formalin and blocked with 5% serum for 1 hour at 21°C; antigen retrieval was by heat mediation in a citrate buffer. Samples were incubated with primary antibody (1/500) for 12 hours at 4°C. A Cy3-conjugated Donkey anti-rabbit polyclonal (1/200) was used as the secondary antibody. 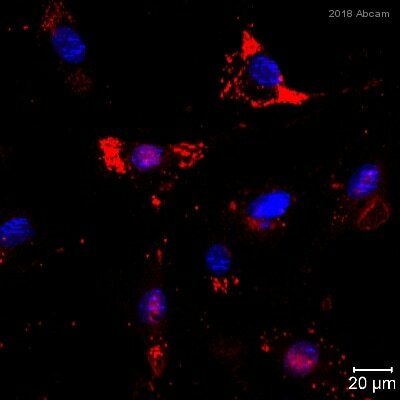 ab34710 staining Collagen I in horse bronchial fibroblast cells by Immunocytochemistry. Cells were fixed with acetone and blocking with 3% BSA was performed for 1 hour 30 minutes at 40°C. Samples were incubated with primary antibody (1/500: in 3% BSA/ PBS) for 12 hours at 4°C. An FITC-conjugated goat polyclonal to rabbit IgG was used at dilution at 1/160 as secondary antibody. 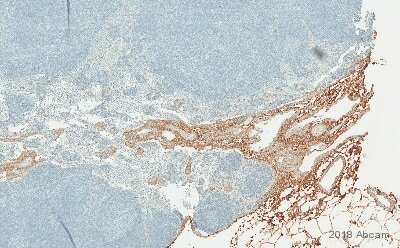 ab34710 staining Collagen I in sheep jejunum tissue sections by Immunohistochemistry (IHC-P - paraformaldehyde-fixed, paraffin-embedded sections). Tissue was fixed with formaldehyde and blocked with 0.25% protein block for 1 hour at room temperature; antigen retrieval was by heat mediation in a 10 mM citrate buffer, pH 6. Samples were incubated with primary antibody (1/400) for 1 hour. An Envision +system HRP anti-rabbit, goat polyclonal (HRP polymer conjugation) was used as the secondary antibody. Immunohistochemistry (Formalin/PFA-fixed paraffin-embedded sections) - Anti-Collagen I antibody (ab34710)This image is courtesy of an Abreview submitted by Carl Hobbs, King's College London, United Kingdom. Immunohistochemistry (Formalin/PFA-fixed paraffin-embedded sections) analysis of marmoset kidney tissue labeling Collagen I with ab34710 at 1/500 dilution. Tissue samples were fixed with formaldehyde and blocked with 2% BSA for 10 minutes at 21°C. Heat mediated antigen retirval was performed using citric acid. Samples were incubated with primary antibody (1/500 in TBS/BSA/azide buffer) for 2 hours at 21°C. A biotin conjugated goat anti-rabbit IgG polyclonal was used as the secondary antibody. IHC image of Collagen I staining in normal human placenta formalin fixed paraffin embedded tissue section*, performed on a Leica Bond™ system using the standard protocol F. The section was pre-treated using heat mediated antigen retrieval with sodium citrate buffer (pH 6, epitope retrieval solution 1) for 20 minutes. The section was then incubated with ab34710 at 5 µg/ml, for 15 minutes at room temperature and detected using an HRP conjugated compact polymer system. DAB was used as the chromogen. The section was then counterstained with haematoxylin and mounted with DPX. Immunohistochemistry (Formalin/PFA-fixed paraffin-embedded sections) - Anti-Collagen I antibody (ab34710)This image is courtesy of an Abreview by Carl Hobbs. ab34710 staining Collagen I in cow small intestine tissue sections by Immunohistochemistry (Formalin/PFA-fixed, paraffin-embedded sections). Tissue was fixed with formaldehyde and blocked with 2% BSA for 10 minutes at 21°C; antigen retrieval was by heat mediation in a citrate buffer. Samples were incubated with primary antibody (1/1000 in TBS/BSA/azide buffer) for 2 hours at 21°C. A biotin conjugated goat anti-rabbit IgG polyclonal (1/300) was used as the secondary antibody. ab34710 staining mouse kidney sections (ab4606) by IHC-Fr. Kidney tissue was cryoprotected with 30% sucrose, sectioned using a cryostat at 10 microns and mounted onto slides. After drying overnight in fume hood, sections were fixed in 4% formalin in PBS for 10 minutes. Blocking was performed with 1% BSA for 10 minutes at 21°C. Staining with ab34710 at a 1/100 dilution in TBS/BSA with 0.02% azide was performed for 2 hours at 21°C. A conjugated goat anti-rabbit 594 polyclonal antibody at 1/1000 was used as the secondary antibody. Detection of collagen I in Wistar rat hepatic stellate cells in GFP-transduced (left lane) and PPAR?-transduced cell lysates (right lane). 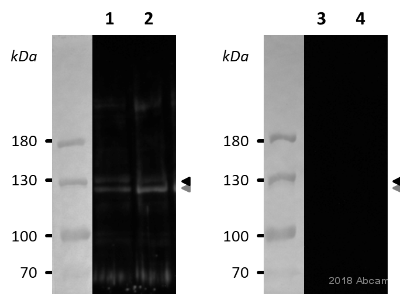 Protein staining shown below each blot depicts equal protein loading. An equal amount of the whole cell protein (100 µg) was separated by native PAGE and electroblotted to nitrocellulose membranes. 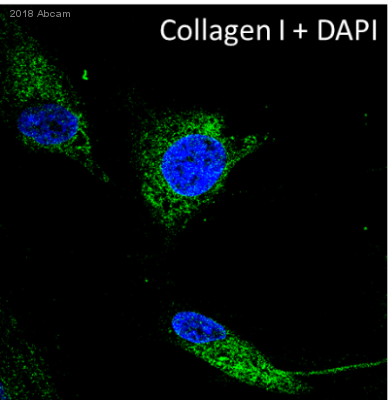 Proteins were detected by incubating the membrane with anti-Collagen I antibody at a concentration of 0.2–2 µg/10 ml in TBS with 5% non-fat milk. Immunohistochemical analysis of human colon tissue sections labelling Collagen I with ab34710 at a dilution of 1/200. The sections were fixed with formaldehyde. The secondary antibody used was an HRP conjugated rabbit IgG. Antigen retrieval was heat mediated using CC1. Immunohistochemistry (Frozen sections) - Anti-Collagen I antibody (ab34710)Image is courtesy of an Abreview from Carl Hobbs. Immunohistochemical analysis of formaldehyde-fixed frozen bovine tendon sections, labelling Collagen I with ab34710 at a dilution of 1/500 for 2 hours at 21°C. 1% BSA was used as a blocking agent and incubated for 10 minutes at 21°C. Secondary used was a Goat anti-Rabbit Alexa Fluor® 594 conjugate used at 1/1,000.